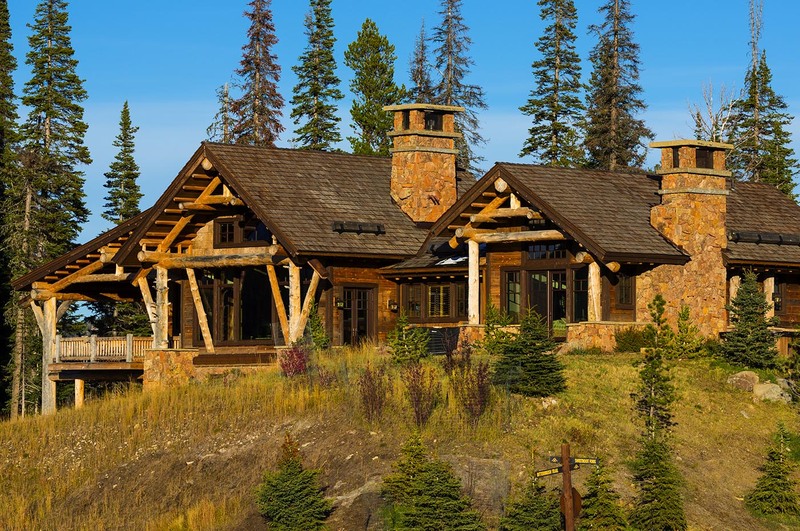 This project is set in the midst of an old growth pine forest on a bench overlooking the Spanish Peaks Resort in Big Sky, Montana. 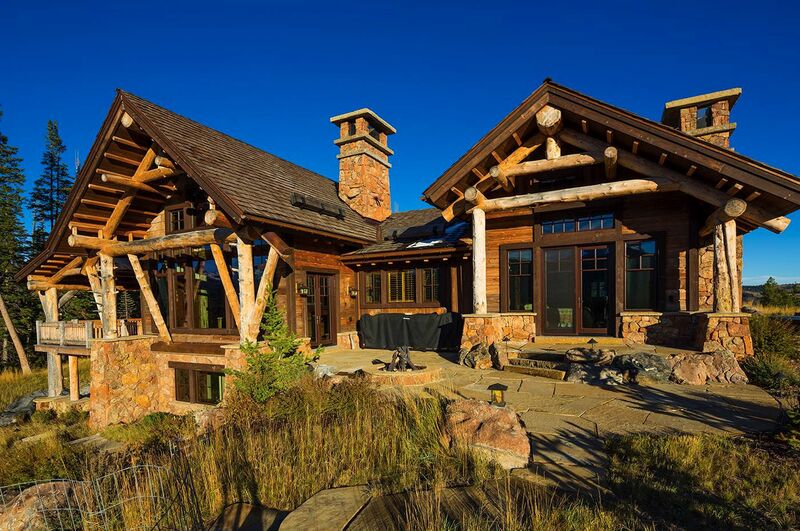 The many positive aspects to the site such as the spectacular views to Lone Peak and the Spanish Peaks Mountain Range, relatively flat topography, and the tall pines that surround, all led to the development of the finished home. With the desire to design a home that had as little as possible impact to the existing site conditions, the house was situated such that it took good advantage of the views yet minimized the amount of trees taken, and the driveway was designed to meander through the tall pines, apposed to leveling out a straight shot. The few old growth trees that were removed during construction were re-used throughout the home as signature columns, bar tops, and fireplace mantles. Conditions on the site also led the design to rotate a portion of the plan at an angle less than 90 degrees, opening up space for an auto courtyard and allowing more of the structure to obtain southern exposure from the sun. The resulting floor plan offered certain spaces to jut out from the forest to gather views while other elements remain shrouded by the forest. The main entry centered on the auto courtyard, was created to express interest and design ability with a mixture of angled timbers and vertical log columns supporting a repetition of trusses and wood purlins. Several opportunities for developed exterior spaces, such as patios with a built in hot tub and fire pit as well as exterior decks for eating and lounging, arose during the design process. The materials that compose the exterior mass of the home consist of poplar bark siding, horizontal wood planking, vertical board and battens and a mix of exposed timber and log structural elements, all set upon a heavy stone base. The interior spaces are centered on a central great room with a framed view to Big Sky’s famed Lone Peak, with the kitchen and dining directly adjacent. The spacious kitchen was designed to be completely open to the great room and features a double sided island, centered about the hearth. Secondary spaces radiate from the central core in wings composed by views and site configurations. A cozy sitting room/Study utilizes space that serves as link to the Master suite and incorporates a library ladder, offering a unique element to the space.